Butler's best was not enough to make up for substandard performances and coaching decisions from the Sixers. 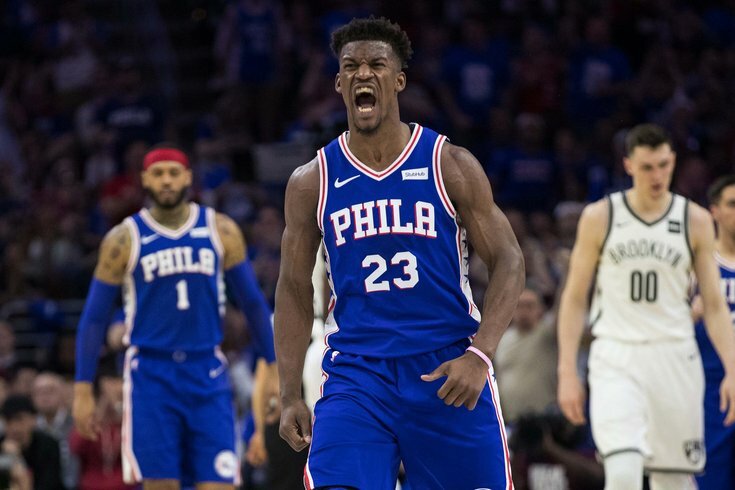 Philadelphia 76ers guard Jimmy Butler (23) reacts after scoring and being fouled against the Brooklyn Nets during the third quarter in game one of the first round of the 2019 NBA Playoffs at Wells Fargo Center. Everybody likes awards. Five Star Review is our way of catering to that urge, spotlighting key sequences and performances, in-game oddities, puzzling quotes, and everything in between from each Sixers game. This space offers a chance to reflect further on observations from the night before using video, quotes, and good old-fashioned logic. You should all know how a five-star scale works: a five-star performance is the best of the best, a one-star performance is the worst of the worst. Mistakes take precedent in defeat, excellence takes precedent in a victory. You get the picture and are encouraged to submit your own set of stars in the comment section below. Today's game: an excruciating Game 1 loss to the Brooklyn Nets. Since the over-discussed film session from December where Butler allegedly got into it with Brett Brown, there was always one question on everyone's minds. "Is playoff Butler worth putting up with whatever headaches might come beforehand?" If we're judging on Game 1, the answer is a resounding yes. "That was the adult in the room. That was a man," Brown said after the game. "We see it here in Philly in the regular season, fourth periods stand out a lot, but you saw it kind of consistently spread throughout the game. The physicality of the game, elite athleticism, toughness...he was trying to pull others along." Butler combined all those qualities with smart play, too. When Jarrett Allen was in early foul trouble for Brooklyn, it was Butler who drove right at him and forced Allen to take his third foul of the first quarter. It was Butler who sent some of the only useful help defense of the night, digging down to cause turmoil around the rim, in addition to playing the team's best on-ball defense of the day. He was the man for Philadelphia on Saturday afternoon, pouring in 36 points in 39 minutes, and he was one of the only players who refused to let the circumstances dictate how he played. When the ball was in his hands, he played with purpose. When he went several possessions without a touch, he would soar in for offensive rebounds, or at the very least make Brooklyn work to secure the basketball. There are lessons to be learned there for their other big names, Ben Simmons and Tobias Harris in particular. And still, Butler came down on himself during his postgame availability, stressing confidence in the rest of his teammates while expressing disappointment about his inability to be a playmaker. "The thing that bothered me the most, to tell you the truth, is the fact that I didn't have a single assist," Butler told reporters Saturday. "I think if I'm getting everybody else involved and getting everybody else easy shots, I think the game goes a different way. I'll go study the film and see how I can find my teammates better, to tell you the truth." There are times this year when Butler's words have come off more like lip service than leadership. Saturday was not one of those days. He might not have another 36-point night, but this version of Butler is one worth building around. Joel Embiid was clearly not himself on Saturday. He had a brace on his knee during warmups, abandoned it because it was too tight on his leg (that's sorta the point), and came up with an assortment of great defensive plays at the rim despite being in obvious pain throughout the night. And it was Butler who may have had the best perspective on the value and the cost of Embiid's performance. "I love Jo for going out there and competing," Butler said. "Don't get me wrong, the game is definitely different when he's out there, he's a force to be reckoned with, we all know that. But we all want him to be smart. I think we're capable of winning, I think it's a lot easier when he's out there, but I think health is the biggest thing...it can hurt us if [his health] gets worse." When we spoke to Embiid on Friday afternoon, he told reporters that something was different about what he was feeling compared to before. I believe it based on how he looked out there — he's not a reliable three-point shooter by any stretch, but his jumpers were coming up painfully short, and the drive to bang down low just wasn't there outside of a good stretch to start the game. That's an area where the coach needs to help him, too. Brown noted after the game that the cost of trying to use Simmons as a screener is that Embiid often times has to be a floor spacer in those looks. Beyond that, though, Brown believed fatigue was a big factor in Embiid hovering too much around the perimeter. "To me, I'll point exclusively to fatigue. It's a lot easier running three-point line to three-point line than it is rim-to-rim," Brown said. "None of us should have thought he was going to come flying down the floor." This isn't a problem that's going away. Embiid may get less sore with rest, but his conditioning may suffer if he rests. But the man is out there fighting, and that's more than you can say for a couple of his buddies. It was Boban, not Embiid, who may have been Philadelphia's second-best player on Saturday. That's damning with faint praise, but he proved that he is going to be a factor in this series one way or another. The initial matchups are not good here, with Boban ending up on Spencer Dinwiddie because of Brooklyn pushing the pace after a miss. But Boban ends up navigating through switches perfectly, visibly directs his guys to where he needs them to be, and eventually ends up where he needs to be: at the rim to meet Ed Davis at the summit. On top of that, Boban's confidence in his jumper appears to have increased over the last month. The Nets sagged on him several times throughout the night, and while he doesn't have the quick trigger Embiid does, Boban made Brooklyn pay for not respecting him as a shooter. Brooklyn is not going to make it easy to get this version of Boban if they have a say in it. When Boban got going in the first half, Kenny Atkinson turned to Jared Dudley at center for a bit. That turns into a game of trading scores, which is not something either coach really wants to do. Who will back down first, Brown or the coach up 1-0? While Brown has adjustments to make, I don't think this is one of them. Boban needs to be out there in this series. With James Ennis on the shelf, I don't think the Sixers have a lot of good choices to turn to in the rotation. I'm still trying to figure out why Brown thinks Jonathon Simmons is an answer of any kind after not playing him in real minutes for the better part of a month. During and after the game, a lot of criticism centered around Philadelphia's defensive scheme against Brooklyn's guards. I insisted prior to Game 1 that I believed the Sixers were going to use the same looks they had all year against the Nets, and that proved to be the case. And I'll say something that'll probably be unpopular here — I don't think the scheme is the problem. The trio of D'Angelo Russell, Caris LeVert, and Spencer Dinwiddie shot a combined 24/57 from the field, with Russell and Dinwiddie both shooting worse than their season averages. They are going to go through hot and cold spells shooting, and you're going to have to live with that on some level. The whole justification for playing veteran guys in this spot is that they're supposed to be ready when their number is called. Someone forgot to tell Simmons. That didn't stop Brown from giving him JJ Redick's spot on the floor when Redick picked up his fourth foul in the third quarter, a spot where I thought Brown should have let it ride because Redick was finally showing signs of life. T.J. McConnell was not among the team's top problems on Saturday, but as has been the case for the last couple months of the season, his specific limitations just are not acceptable on this team anymore. If an open three comes his way on the weak side, he has to be willing to take it or he simply can't play. There's a difference between playing within yourself and being so overly concerned about only shooting from "your spots" that it hurts the team. That sequence is every bit as bad as what Markelle Fultz was crushed for when he was here, the paint-stacking every bit as dramatic. Shoot or get off of the floor. Zhaire Smith is wildly inexperienced and may not even really know what he's doing yet, but he has to play in Game 2. He has no fear to shoot, he's one of the team's best at fighting through screens, and he will at least give you an injection of energy. By the way, Brown is fortunate Boban is playable in this series because the small-ball look the Sixers went to on Saturday and tried out for a lot of the last two months is an absolute disaster. Lineups that feature Mike Scott and Ben Simmons without one of their bigs on the floor got outscored by six points per 100 possessions in the regular season, and Scott getting roasted in space has been a common theme in those looks. The numbers show the product of that issue — Philadelphia puts teams on the line on over 26 percent of possessions in these looks, with their guys flailing around without a true rim protector behind them. On several levels, this rotation is a mess. I covered this ground yesterday, but let me emphasize it again — the Sixers are going nowhere if Simmons doesn't raise the bar. Tobias Harris and JJ Redick both turned in clunkers on Saturday, but the Sixers have to work their entire structure around Simmons' critical flaw.